After being accused for his girlfriend’s gruesome murder, a man grows horns and realizes that they give him the power to find the person responsible for the death of the love of his life. 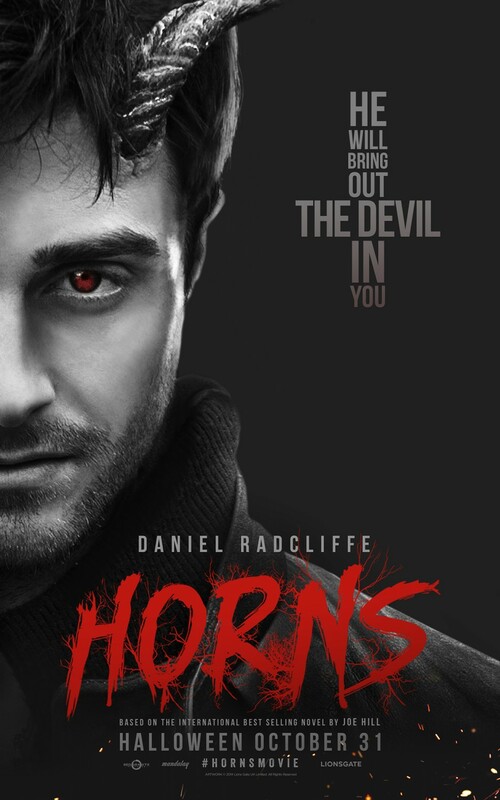 I was looking forward to see Horns, mainly because I loved the whole idea of it, and was excited to see Daniel Radcliffe in a movie that actually takes place at present times. Little did I know that this was going to be the biggest disappointment I had in a while. The movie starts very odd and the script feels very cartoony especially the dialogues, but since the plot was interesting I was willing to overlook that. After 30 minutes I got frustrated with the main character and how he doesn’t use his “powers” in a smart way, but instead, runs around without a clue, transforming from what I thought was going to be the hero of the story, into an annoying cry baby. This genre is definitely not Alexandre Aja’s strength, he should stick with directing horror movies. While this movie is advertised as a horror mystery it is more of an intense mystery drama with a few comedic elements. The acting seems forced and lifeless. There are no emotions, nor motives given to the characters, which is why they seem constantly confused, and at the end when the final showdown was supposed to happen, I was not even surprised that it fell flat. The entire time I kept wondering if the book the movie is based on is just as bad. It was written by Stephen King’s son, so I would have expected something different. I wouldn’t know who to recommend this movie to. As a matter of fact, I wouldn’t even know what to compare it with. I felt sorry for all actors involved since none of them couldn’t really show what they are capable off. Daniel Radcliffe to me is like Kristen Stewart: While I think he is good actor, it seems hard to find the right character for him to play due to his one dimensional performances. But maybe he hasn’t been given the right script yet. I know exactly what you mean. Like a car wreck, everyone tells you to not watch it but you do it anyway. I felt that way with many movies! 🙂 With low expectations there might be a chance you will think it is oaky. I just couldn’t get into it after being so intrigued by the trailer. you might have a point there, friend! I haven’t read the book but I heard from several people that the book is the one to go for! Thanks for the review! I will have to check this out soon, see what I think. It’s been on my most anticipated list for quite some time now, so let’s see what I think. Oh yes please, let me know what you think. I have been waiting for this movie for a while, too. Have you read the book? And yes, I have read the book. I enjoyed it, felt it fizzled at points, but Joe Hill’s work is like that for me. Definitely interested in seeing how it compares. Oh wonderful, I can’t wait to hear your opinion since you have read the book!